My present to myself this year... a 3D Printer. Some may not know I build props and stuff with my son. 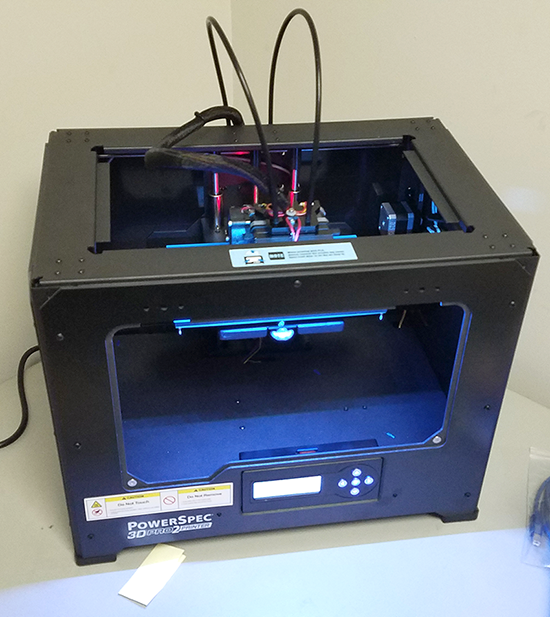 I decided to step it up a notch this year and get a 3D printer, he doesn't know because I have in my office at work. Using it to make up birthday gifts for this year. 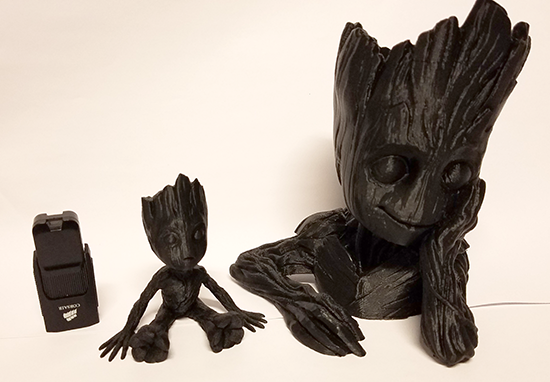 Groot stuff for my daughter, and rebuilding Daft Punk helmets we made couple years ago for my son to make them more accurate. The things people are doing with 3D printers is incredible! I like the Groot flower pot! they have come a LONG way in the last couple years. For 500-700 hobby range setup you can get one that doesn't need constant fiddling once setup. The truly expensive part is the filament. The good stuff is $30+ per 1kg roll, midrange US made $20 per 1kg roll, the budget stuff out of china is $15 per 1kg roll. 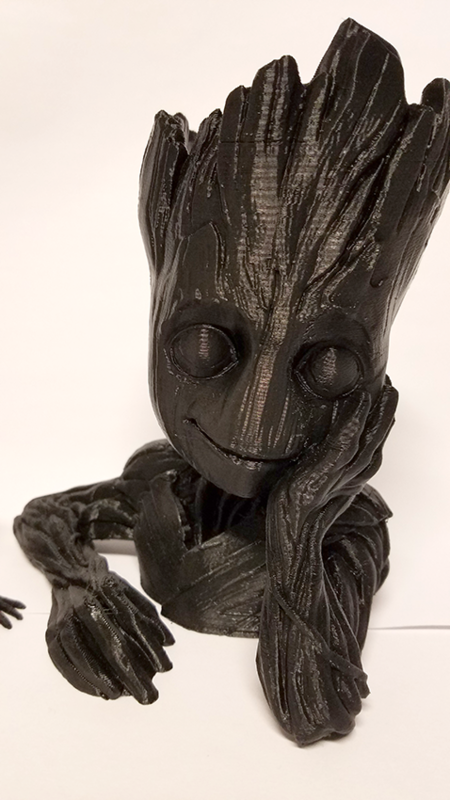 The exotic stuff like nylon, flexible stuff, and copper/carbon fill filament is $$$.... and the new resin printers.. can get the hobby grade Form2 for around $3,500. As for not being able to draw, not so much an issue with sites like Thingiverse and MyMiniFactory. Its where I got the models I have printed thus far. I'm working on designing my own enclosures for some Raspberry Pi and Arduino projects. You should charge for calming therapy/spa services. I would like the ability to scan objects in 3d also with better detail than I have seen. 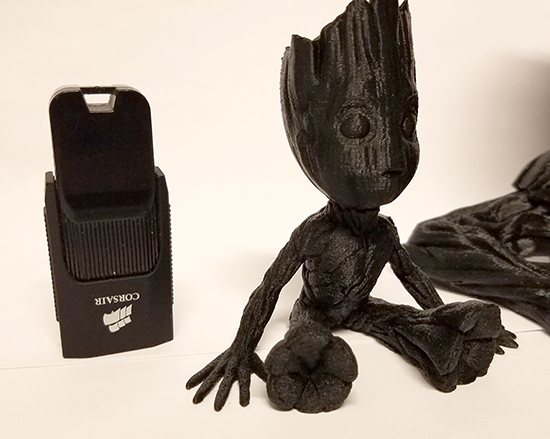 Still amazing what you can get and print, like you said! Woah! I am thinking of getting a 3d printer too. Any good suggestions? The Powerspec 3D Pro I have has done quite well. Going down in cost is the Monoprice Marker Select Plus, do the mosfet mod to ensure there is no failures to the electronics. I would also highly recommend Simplify 3D slicing software, not cheap at $150, but has taken a LOT out of the learning curve frustration. These are not magical, they require some attention to get running perfectly. on the handy side and think you can handle the tinkering to get one running, build one, Marker Farm Pegasus, Folger Tech FT-5 or 2020, SeeMeCnC Rostock Max v3. bubba wrote: Going down in cost is the Monoprice Marker Select Plus, do the mosfet mod to ensure there is no failures to the electronics. I was looking at that one and the Maker Select 3D Printer 2 - from what I have been reading, the Plus does NOT need the MOSFET mod but the 2 does. Seems they put a new version of the Melzi board in the Plus which fixes the problem. Little out of the loop here. I was considering getting a v2 later this year, but hearing about this recurring issue makes me concerned about running prints overnight/ away from home. Yeah, I keep hearing "get the MOSFET!" but my question is: does the new MP Maker Select Plus also face these issues? AFAIK, the Maker Select Plus does not. A lot of people say the root cause is the heated bed output terminals on the Melzi board, but this is actually inaccurate. Adafruit did an analysis where they claim that the actual issue is the traces on the board being too thin to carry the amount of current they are. Unfortunately, their fix is a new version of the Melzi board, which most of us can't (or don't want to) do.